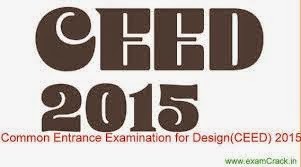 The Common entrance examination for design (CEED) is an all India level examination conducted by Indian Institute of Technology (IIT), Bombay on behalf of the ministry of human resources development, India. CEED 2015 is an application form online and has to be filled between the dates of August 4, 2014 and September 10, 2014. Interested candidates must check their eligibility criteria and apply their online applications before the deadline. The document is in the support of the form which is needed to be uploaded online. The candidates need not have to send their applications or documents to IITs and IISc for the application. The application fee for the CEED examination is given below. The application fee is non-refundable. The students are required to pay the application fee through ‘State bank of India collect facility’. The facility details and the payment process are provided in the website. The Bank may have additional charges for the service on the above transaction. The CEED application must be only submitted online and through the official website ‘www.gate.iitb.ac.in/ceed2015.’ The candidate if wishes to change any particulars about him/her, they may do so by sending an email to ceedoffice@iitb.ac.in and a written request to Chairman, CEED 2015, IIT Bombay, Mumbai 400076 before the date of 20th September 2014 along with the necessary documents and mentioning your application number. Please note the mobile number and email id cannot be changed. In order to complete the application process, you need the following. 1. .jpg file containing your recent photograph. 3. Scanned copy of your PwD certificate issued for the PwD catgory by the appropriate authority. 4. Scanned copy of the category certificate (.pdf file) for SC/ST or OBC categories. 5. Details of the SBI collect money transfer towards the application fee. 6. Scanned copy of your eligibility certificate, degree certificate if the course is completed and the certificate from the Principal of your college. The candidates are required to upload these files trough electronic means while applying for the application. Paper copies should not be sent to the CEED office and therefore, such applications will not be entertained. The candidates are required to correctly upload the photograph and signature with their valid specifications and requirements mentioned in the website and application brochure to upload them properly. The uploading of photographs and signature image file without proper specification may lead to disqualification of the application. The payment process is through onlinesbi.com. The applicants have to submit through the website either by Internet Banking, Credit cards and Debit cards. The CEED examination requires the candidate to appear for the following tests which will be selection factor for the candidates. Kindly post your replay for "CEED Application process & Selection"